This year, Chevrolet is highlighting its Malibu as the premier midsize family sedan. In its 30 plus year career, the Malibu has been a consistent win for its safety features and has taken home Car of Year Award on multiple occasions. The 2016 Malibu was favored at this year’s New York Auto show by critics and fans alike. If one thing has been made clear throughout its history it’s that the Chevy Malibu has been an impressive ride in the past and still continues to be. Chevy Albany wants you to celebrate the 2016 Malibu. When you think of Malibu in the 1960’s, what comes to mind? Sunshine, surf and rock and roll, right? Back then, Southern California’s car culture was almost as important as surf culture was. The Beach Boys exposed that scene to America with their song “409” which celebrates Chevy’s high-performance engines. 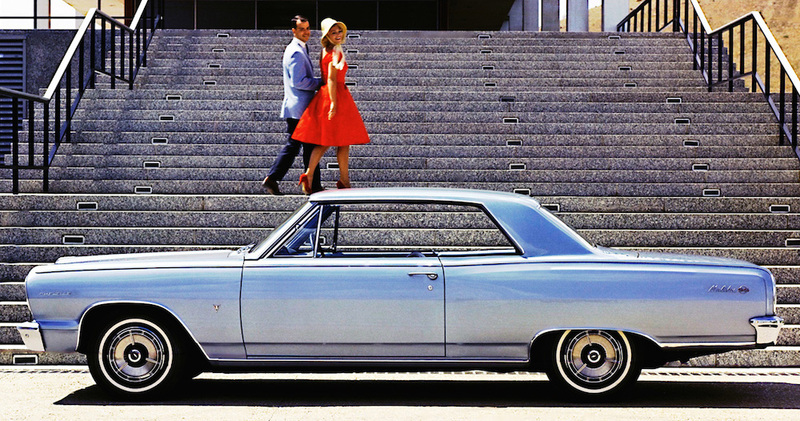 In 1964, Chevrolet introduced the very first Malibu. Like its namesake city, it was fun, youthful and happening. Though the Chevy Malibu was a rear wheel drive vehicle, it offered 300 horsepower in a small block V8 and you wouldn’t have expected it, but the Malibu premiered as a small family sedan. For the times and especially for a family vehicle, it was quite audacious but no one could deny that it was certainly fun to drive. It was also wildly popular. Within its first year, it sold over 200,000 units! With muscle cars everywhere in the mid to late 60’s, Chevy didn’t want to miss out. Born from the Malibu were the Chevelle and SS. Introduced as Malibu’s muscle car brother’s, though the Malibu was the top line Chevelle, the SS would come to forever mean legendary horsepower for every Chevy to wear its badge. Little changed for its second generation, 1968-1972, and there wasn’t much need to. With its growing popularity and demand from consumers, Chevy had tapped into a part of America that was buying into the Malibu lifestyle. As the Malibu was rising to become Chevy’s premium sedan. Minor updates allowed it to still be a better family car as a smaller vehicle without compromising its spirited energy. The third-generation Malibu belonged to Nascar. Starting in 1973 and lasting till about 77, the Malibu became more aerodynamic. Offering a host of engine choices, from a big block 396 cubic inch V8 to a small block 350, this generation ended up in Nascar’s winner circle not once, not twice but 25 times. The Fourth Generation Malibu came out in 1978. It answered the demands of the people who wanted to have better fuel economy. While it was still being offered as a coupe, sedan or wagon, it was smaller in size than its predecessors. This generation would last until 1983 when the Malibu was discontinued. …but not for good. After a brief hiatus, Chevy decided to return the Malibu in 1997 as a brand new car. After 30 years of providing fun, sunny Malibu weather to everyday American drives, its re-introduction was met with fame and praise. Those who had grown up driving the Malibu from the 60’s were excited to see its return. While it was gone, the American market for sedans had changed. New focuses on safety and image were emerging. During its absence, other sedans had been taking its place but the 1997 Malibu showed up and reclaimed its spot as the favorite. The reviews were showing that it had indeed been missed and people were glad to see it back on the market. Chevrolet had a lot to be proud of in 1997 as the Malibu was awarded Motor Trend’s Car of the Year. There was no question whether bringing the Malibu back was the right choice. The only question following that was how to keep this momentum going. Chevy had it figured out. Still growing and maturing, the Sixth Generation started offering more advanced features. This was both a generation and a customer that knew what it was looking for in a sedan. With improved technology and efficient performances, Chevy sought to improve the riding and handling. Its model was now based off a global platform with updates to its exterior including a brand new grill which would become the new face for Chevrolet, as well as two signature rounded tail lights. In 2009, Chevy introduced the Malibu Hybrid. Featuring an electric motor that shuts the gasoline engine off when idling, it boasts a 2.4L ecotec with a 4 cylinder engine and 4-speed manual transmission. Offering other features like keyless entry, automatic climate control and satellite radio, it was clear Chevy had clued into exactly who was buying their new Hybrid. In 2010, the Malibu was GM’s top-selling passenger car at nearly 200,000 units sold. Producing for the global market for the first time in 2013, GM announced the Malibu Eco into the world market. Designed for 100 markets in six continents, the Malibu continues to meet success all over the world. Offering two different engines: a powerful 197 horsepower 2.5L 4-cylinder ecotec engine in a 6 speed automatic transmission and a second even more powerful option at 259 horsepower 2.0L Ecotec turbocharged 4-cylinder engine. Both engines give strong performance and have excellent fuel economy. The new 2016 Malibu includes a feature developed for teen drivers and is aptly called Teen Driver. It works by entering a special PIN code in the onboard computer system from which the parents will be able to track distance, speed and any safety features that may have been activated while the teen was driving, ie; airbags, anti-lock brakes. Teen Driver also helps to increase safety with features set to remind the driver of seatbelts, warn of speeding when predetermined speed is set. In the very competitive segment of family sedans, this system is putting the Malibu above the rest. With all the successes that Chevrolet has encountered with the Malibu from 1964 and since its return to the stage in 1997, it is no wonder that it continues to grow, impress and win with car dealers, shows and audiences.